I am living the dream! I have the best job in the world, I live in beautiful north San Diego county, I have a terrific group of patients and an amazing office staff! I look forward to coming to work every day. My two greatest gifts are my ability to get along well with people and my common-sense approach to problem solving which works perfectly in the world of orthodontics. I have practiced orthodontics for over 25 years and have thoroughly enjoyed every year. I grew up in Springfield, Missouri and enjoyed being my high school’s student body president and co-captain of our state champion football team. After attending Vanderbilt University and Missouri State University where I was my fraternity president, I went south to Dallas and graduated with honors from Baylor College of Dentistry where I was student body president. I then moved west to Los Angeles to attend the prestigious and nationally ranked University of Southern California’s orthodontic program where I received my certificate in orthodontics and a Master’s degree in Craniofacial Biology. After graduating from USC, I practiced in an exclusive all-child orthodontic practice in Santa Monica. I got married and decided that living in San Diego was a better place to live and raise a family. 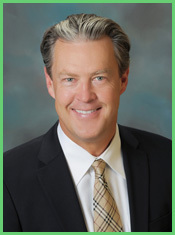 I had practices in Carlsbad and Carmel Valley before joining our current Inland North County practice in 1996. I am proud that I am one of the very few Lifetime Diplomates of the American Board of Orthodontics in the area. I love to go to as many continuing education courses as I can, so I can stay on top of this rapidly changing field and provide my patients with the best possible treatment. My wife, Cynthia, and I live near Lake Hodges. We have two sons. William is studying Biology at Arizona State University while Andrew is studying finance at the University of San Diego. We have two West Highland White Terriers named Dolly and Callie. My outside interests include USC football, Padre Baseball, local high school sports, cooking, entertaining friends, traveling and riding my BMW touring motorcycle. I met my wife in pre-school and I played Pop Warner football with Brad Pitt (I was the second cutest kid on the team). My sister is an attorney back in Missouri and is married to an orthodontist. Our dogs’ grandmother is the dog on the Cesar dog food label. I am proud of our fun-loving, talented, experienced and well-trained staff. Two of our assistants have worked in this office for over 39 years in a row! Our office reputation is demonstrated by the numerous local dentists, oral surgeons, periodontists and endodontists who have chosen our office for their own family’s orthodontic treatment.